There is a frenzy of activity down at the shed as shipwrights "steam" ahead replacing the last remaining frames over the next few weeks. Watch in awe as our shipwrights build tailor made frames from laminates. 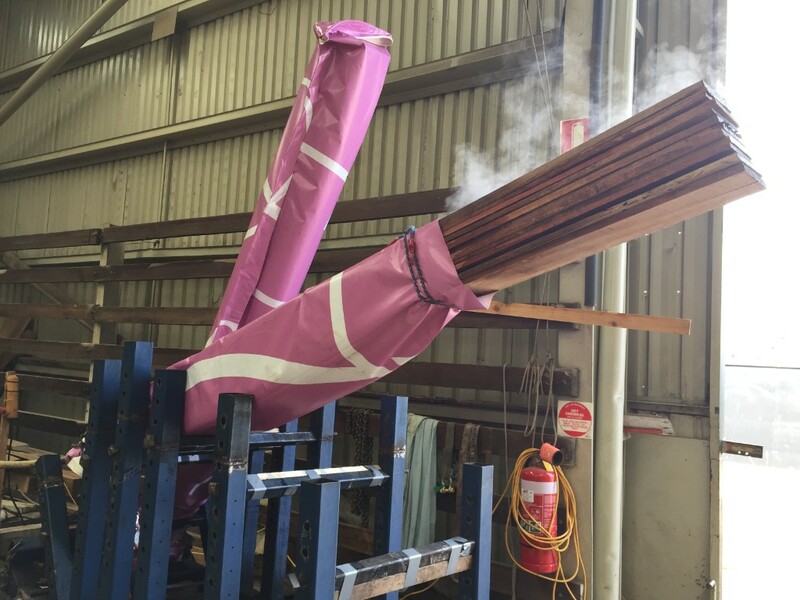 Watch as they steam, bend, glue, shape, paint and bolt these huge frames into place. 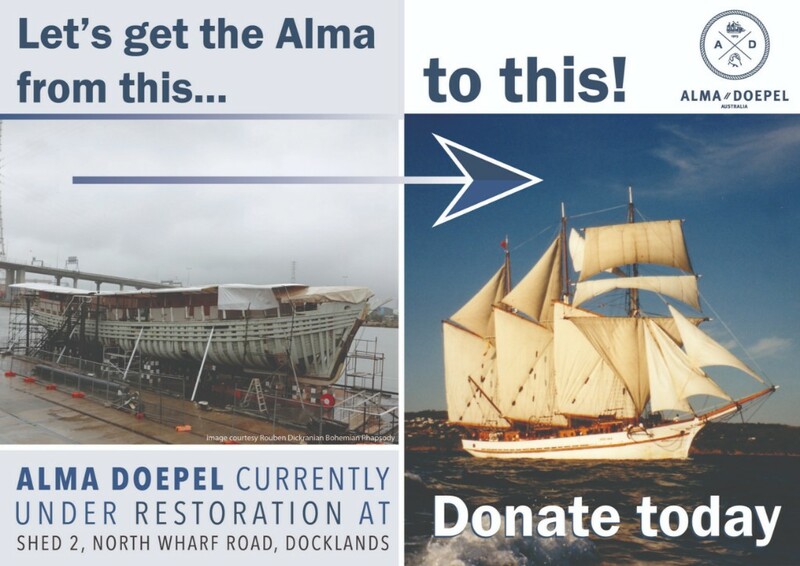 Friends of Alma Doepel are invited to come down and take part in a tour of the restoration. We are open from 11am to 4pm Monday to Sunday except Friday 12 October as that is Alma's Birthday Dinner at the Royal Yacht Club Victoria. A huge thank you to all our members and volunteers who have put their hands up to help out during the week. Each week day we experience a large numbers of pedestrians strolling past the shed from around 12noon to 2pm. They will be able to enjoy Alma Doepel during Seniors Week too! There is a spectacle to behold with a frenzy of activity down at the shed as shipwrights "steam" ahead replacing the last remaining frames over the next few weeks. Watch in awe as our shipwrights build tailor made frames from laminates. Watch as they steam, bend, glue, shape, paint and bolt these huge frames into place. 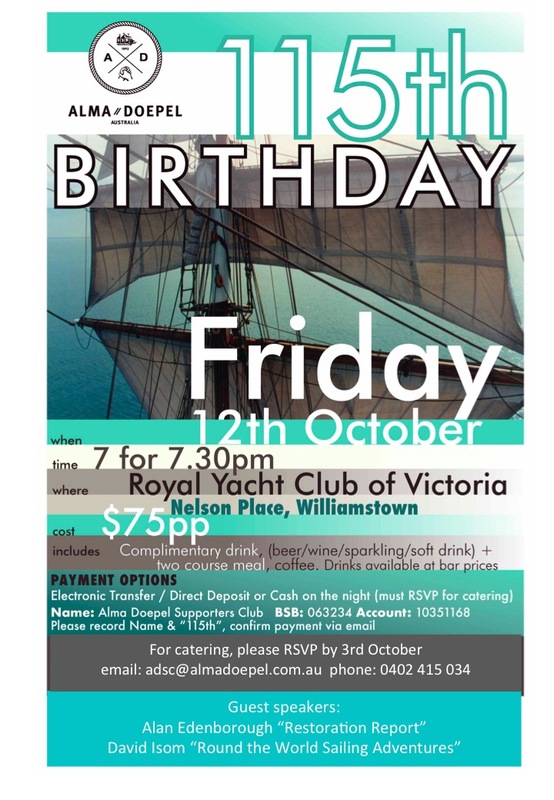 Alma Birthday Dinner – Royal Yacht Club Victoria Friday 12 October 7pm. A reminder there are still a few places left for the Alma Birthday Dinner on Friday 12 October. Let Karin Otto karinotto@gmail.com know asap please. A big week coming up! Supporters will be flying the flag for Alma flag everyone! There is a lot of progress being made. 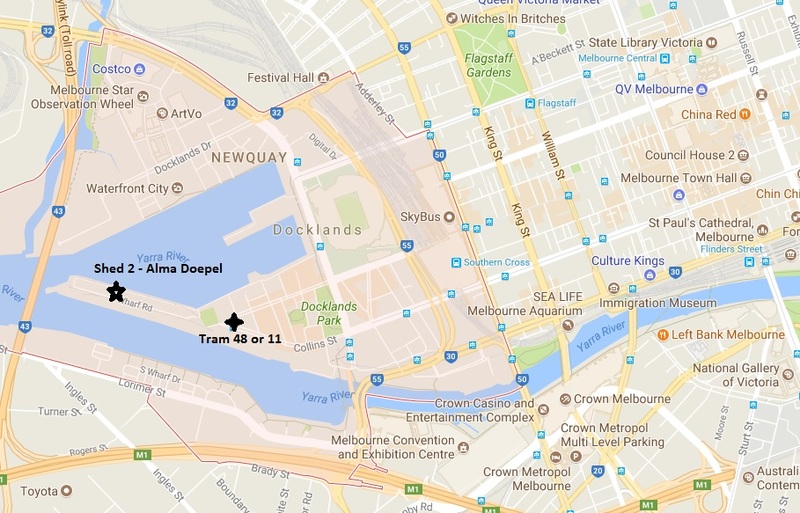 Alma turns 115 years old on Wednesday October 10 and to celebrate the Alma Doepel Supporters Club hold an annual Birthday Dinner at the Royal Yacht Club Victoria in Williamstown on Friday 12 October. The thrill of taking off and landing in the water is an incredible experience. Departing from Gem Pier in Williamstown taking off then crossing over the bay to Elwood, flying past St Kilda and Port Melbourne to the West Gate Bridge and then down the Yarra River to Williamstown. Enjoy a round of golf at Woodlands for 4 people. Still a few places left, so be quick!! There are some great auction items including a Seaplane Flight! Price includes complimentary drink, two course dinner and tea / coffee. We have guided tours every Tuesday from 12pm-2pm. Just take a stroll down North Wharf Rd and see for your self. Urgent Call for Volunteers to help with the restoration!! Here is your chance to be a part of this great project. We need all levels of skill! There is a lot of work for volunteers to do right now. If you are interested in working on the restoration there are plenty of tasks for anyone to get involved. such as sanding, demolition, painting, doweling, cleaning up plus a myriad of admin type roles. Volunteers are welcome to help out Thu, Fri and Sat 10am-5pm. The Float Alma In 2018 campaign has reached $371,074 towards the $800,000 needed to get the hull back in the water. The Alma Doepel Restoration project still needs to raise $1.2 million dollars to complete the job. So many people have already donated so much to this project enabling it to come a long way. The project has also received much in-kind support through donation of services, materials, tools and labour. The project has come this far because of this support. There is still more to do, and it is worth it! Funds are still needed needed to complete the re-planking of Alma's hull so she can go back in the water. Remember $500 buys a plank and a dedication. and send the deposit confirmation to me with your contact details and you will be sent the CD. 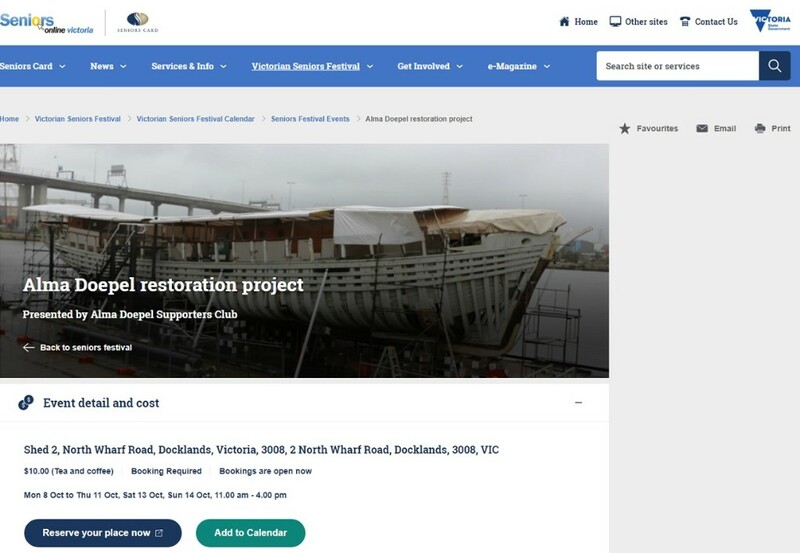 Photos and details of the restoration according to Barry Semple author of the Alma Doepel Chronicles. Click on the link below. Copyright © 2018 Alma Doepel Supporters Club, All rights reserved.